PROPERTY developer SP Setia Bhd wants to expand its landbank across the Penang channel to leverage on the Second Penang Bridge. SP Setia property division (north) general manager Datuk S. Rajoo yesterday said Batu Kawan is the preferred site to establish the company's footprint in Seberang Prai. SP Setia's presence in the northern region is currently on Penang island. "We are anticipating a population growth on the mainland once the second crossing is completed and think it would be prudent to establish a landbank there." He spoke to reporters on the sidelines of the three-day "SP Setia Setia 4U Showcase" which is part of the firm's roadshow to showcase a selection of its products locally and overseas. The Second Penang Bridge, linking Batu Kawan on the mainland and Batu Maung on the island, has been touted to emerge the longest bridge in Southeast Asia with a total length over water of 16.9km upon completion by September 2013. Along with SP Setia, other Penang-based property developers like Tambun Indah Land and Asas Dunia, which are sitting on sizeable landbanks, are anticipating higher sales from the opening of the new bridge. On Penang island where SP Setia continues to expand its landbank, especially in prime locations, Rajoo said the company has seen a 20 per cent take-up rate for 166 of its upscale "Setia V Residences" condominiums along the sea-fronting Gurney Drive. The project, which boasts a dual frontage of the promenade and Jalan Kelawai in Pulau Tikus, is sprawled over a 0.9ha piece of land and comprises a 48-storey and a 43-storey towers respectively. Dubbed as "bungalows in the sky", each unit comes with a dipping pool and a host of other luxurious amenities in what the developer has termed the tallest residential development in Penang. Its smallest unit will measure 2,700 per sq ft.
"Two heritage houses in the grounds of the project site will be incorporated into the development," Rajoo noted, adding that investors for the property, which is tagged from RM2.7 million onwards, include locals, Singaporeans, European, Indonesians and Chinese nationals. He said the project with a development value of RM550 million, will take 48 months to complete (by 2016) owing to its earthquake-resistant design. "Investors only need to pay the downpayment now for their units and the rest will be upon completion of the project," he added. Rajoo said "Setia V Residences" is expected to contribute between 20 per cent and 30 per cent to SP Setia's targeted RM500 million revenue for the group's 2012 fiscal year ending October 31. "Other big ticket contributors to our projected sales for Penang this year will include projects like Setia Triangle, Pearl Villas and 11 bungalow units of Brook Residences which were snapped up before we could even launch the projects," he added. Rajoo said that SP Setia will be launching affordable homes on Penang island in locations such as Balik Pulau. Setia Pearl Island in Penang is one of the property projects that contribute to SP Setia’s profit and revenue. KUALA LUMPUR: SP Setia Bhd’s net profit rose marginally to RM93.38mil, or 4.85 sen in earnings per share, for the second quarter ended April 30, against RM92.2mil, or 5.55 sen in earnings per share, a year ago. Revenue increased 24.2% to RM617.2mil from RM496.7mil. In notes accompanying its financial results, SP Setia said that for property development, revenue increased by 29% while pre-tax profit rose 6%. “The increase in revenue is mainly contributed by higher recognition from residential and commercial properties in the Klang Valley, Johor Bahru and Penang,” it said. The property developer said its pre-tax profit from a year ago had included gain from the disposal of an investment property, resulting in the lower increase in pre-tax profit during the current quarter as compared to the increase in revenue. SP Setia said ongoing projects that contributed to the profit and revenue included Setia Alam and Setia Eco-Park at Shah Alam; Setia Walk at Pusat Bandar Puchong; Setia Sky Residences at Jalan Tun Razak; Bukit Indah, Setia Indah, Setia Tropika and Setia Eco Gardens in Johor Bahru; and Setia Pearl Island, Setia Vista and Setia Greens in Penang. In the first six months, SP Setia posted a higher net profit of RM166.3mil on a 9.2% increased in revenue to RM1.1bil. 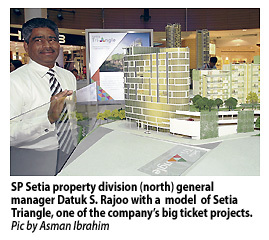 “SP Setia’s strong sales performance has not abated despite concerns about a possible slowdown in the global economy. The group’s 7-month sales for the financial year 2012 has reached RM2.14bil, placing it well on track to achieve RM4bil sales target for financial year ending Oct 31, 2012 (FY12),” it said in a statement. President and chief executive officer Tan Sri Liew Kee Sin said the group’s existing projects in the Klang Valley, Johor Baru and Penang would continue to be the main contributors to sales. “We are aiming to achieve sales of about RM3.4bil from our Malaysian projects, with our overseas projects giving us another RM600 to RM700mil in FY12. “Our Setia Alam and Setia Eco Park flagship projects can easily sustain annual sales of RM1bil collectively for at least the next seven years. We also expect our iconic KL Eco City in Bangsar, which has a total gross development value of more than RM6bil, to contribute RM1bil in sales this year,” he said. He added that the remaining sales would come from its projects in Johor, Penang, Sabah and overseas. “Our six active projects in Iskandar Malaysia are doing tremendously well and we have the breadth and depth of product offerings to put us on track to deliver RM1bil worth of Johor sales in FY12,” Liew said. On economic uncertainty, Liew said it had presented the group with some outstanding opportunities. “In line with our ambitions to become an international property player, we have joined forces with Sime Darby Property Bhd to secure the iconic Battersea Power Station (BPS) site in central London. “This is evidence of SP Setia’s continued focus to acquire choiced assets on favourable terms to further strengthen the group’s growth prospects consistent with its long-term expansion plans,” he said. The joint-bid partners have until July 4 to formalise the acquisition of the BPS site, and will make the necessary announcements in due course. In a separate announcement, SP Setia said its public spread stood at 21.45% on June 15 and hence it did not comply with the public shareholding spread requirement. It said Bursa Malaysia had approved its application for an extension of time of six months until Sept 18 to comply with the required public shareholding spread. “Permodalan Nasional Bhd (PNB) and the company are in the midst of formulating a proposal to rectify the company’s required public shareholding spread, taking into consideration the sustainability of the company’s share price performance and the trading volume of SP Setia Shares. “Nevertheless, as part of PNB’s rectification plans, PNB and several of unit trust funds managed by PNB had pared down their interests in SP Setia by disposing 8.94 million shares in the open market between April 3-13,” it said. 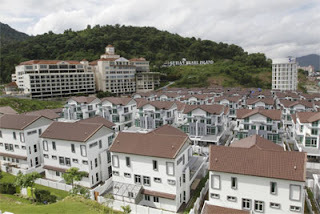 KUALA LUMPUR: AP Land Development Sdn Bhd and its South Korean joint-venture partner Taeseung Construction Co Ltd will build 14,000 landed homes with total gross development values of RM2bil for ex-military servicemen. AP Land chairman Datuk Nazrul Arsad said the indicative prices of these homes would range between RM85,000 and RM185,000 and would be located in Pahang, Perak and Terengganu. Speaking at the signing of a memorandum of understanding between the two companies, Nazrul said the developer could sell the homes at these prices because their costs of construction would be lowered with the use of industrialised building systems (IBS) technology. “These selling prices are about half the prices offered in the market. We are not taking developer margins but we are taking contractor margins. “Our margins may be smaller but we play the volume game. There are 17 sites for a total of 14,000 units of these houses,” he said. “The IBS system is able to lower costs because we buy in bulk. IBS also uses a standard mould which can be used for the building of many houses, and thus reduce costs,” Nazrul added. Tauseung's role in the joint venture includes introducing building methods that could cut construction time from two years to about 18 months, he said. Deputy Defence Minister Datuk Abdul Latiff Ahmad said about 80,000 ex-servicemen were without proper housing currently. “About 3% (of ex-military servicemen) are without housing, perhaps because there was no real policy (for housing) then,” he added.